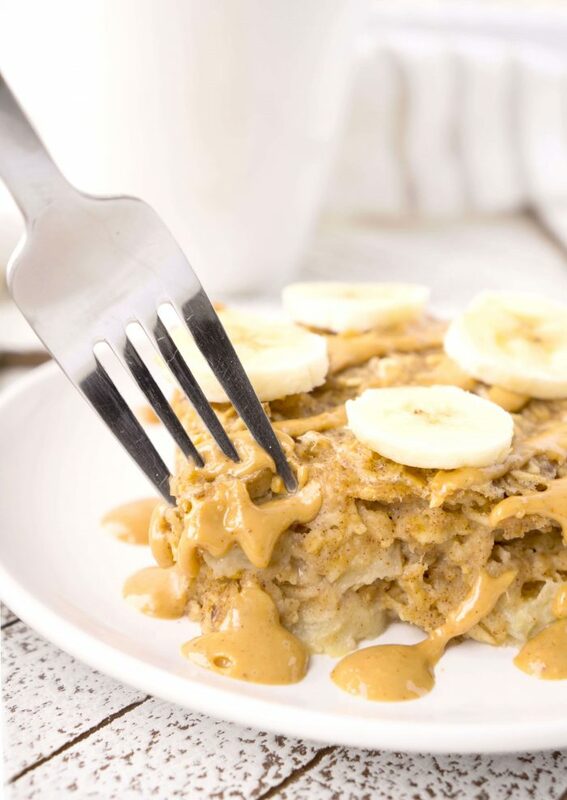 I’ve done a whole bunch of breakfast experimentation with our one-year-old over the past several months and by far, this Peanut Butter Banana Baked Oatmeal ranks number one. When I open the fridge in the morning to grab his piece of baked oatmeal, his face lights up with the biggest grin I’ve ever seen. 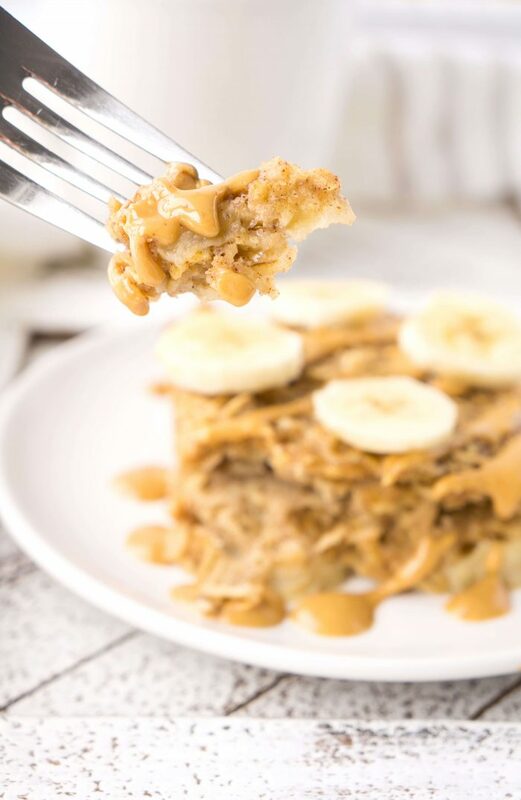 While most adults would light up when they saw a big juicy hamburger or a slice of fudgey chocolate cake, he goes ecstatic for peanut butter banana baked oatmeal. Yup, that’s my boy. Another sign that he adores this baked oatmeal is the speed at which he shovels it into his mouth. These are not tiny little bites, my friends. These are I’m-going-to-shove-this-whole-piece-into-my-mouth-in-case-it-suddenly-vanishes kind of bites. Which, in all honesty, is actually kind of refreshing considering he’s currently going through a phase where he’d rather whip most foods onto the floor rather than put them into his mouth. I’m not quite sure what he expects to happen once the food goes flying over the edge of his tray, but all I know is that it’s a phase that makes pretty much every mother on the planet cringe as she watches all of her hard work get whisked away onto the dining room floor. So, of course, I was thrilled at his enthusiasm to pile the baked oatmeal into his mouth rather than in a heap on the floor. But our little guy isn’t the only one who loves eating this for breakfast. As a mama, I love it too. First of all, it’s super easy to make. In fact, after making it only a few times, I’ve got the ingredients list memorized. I don’t even require the recipe anymore. Aren’t those the best types of recipes? It can also be made in advance and stored in the fridge or freezer, which basically means breakfast-on-demand. No more shuffling around in the cupboard trying to find that box of cereal or hovering over the stove to fry up an egg. It’s just all sitting there waiting patiently in the fridge to be eaten (or devoured in the case of our little guy). So let’s talk about how easy it is to whip up this breakfast miracle. First, you’ll want to preheat the oven to 350 degrees F and grab an 8×8 square or 7 x 5 inch rectangular baking dish. I’ve made this baked oatmeal in each of these types of baking dishes and it turned out equally good each time. Next, you’ll want to spray the dish with cooking spray or use your preferred method to grease the pan. In a large bowl, mix together all of the ingredients for the baked oatmeal with the exception of two of the bananas. Slice the remaining two bananas into quarter inch slices. On the bottom of the greased dish, evenly distribute half of the banana slices. Pour half of the oatmeal mixture over top and smooth out with a spatula. 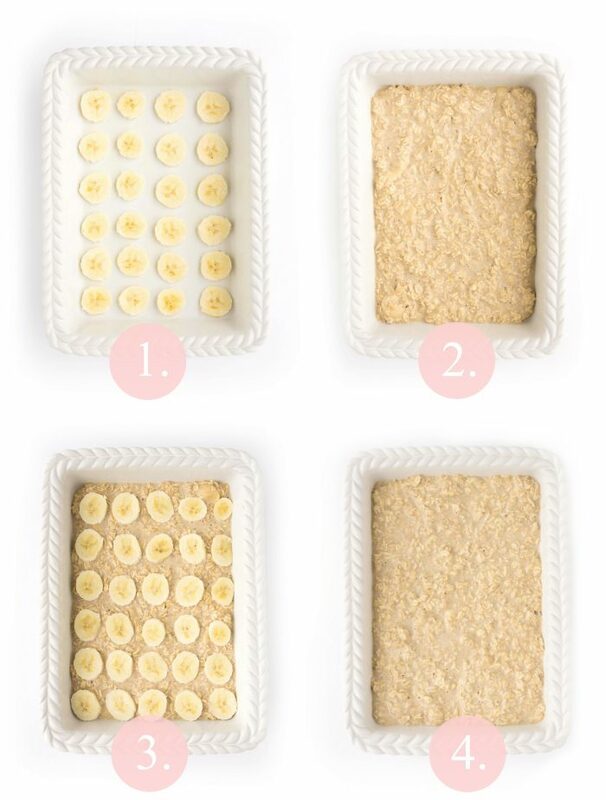 Next, evenly distribute the remaining banana slices on top of the oatmeal layer. Top with remaining oatmeal mixture. Place in the oven to bake for 35 to 40 minutes or until inserted toothpick comes out clean. 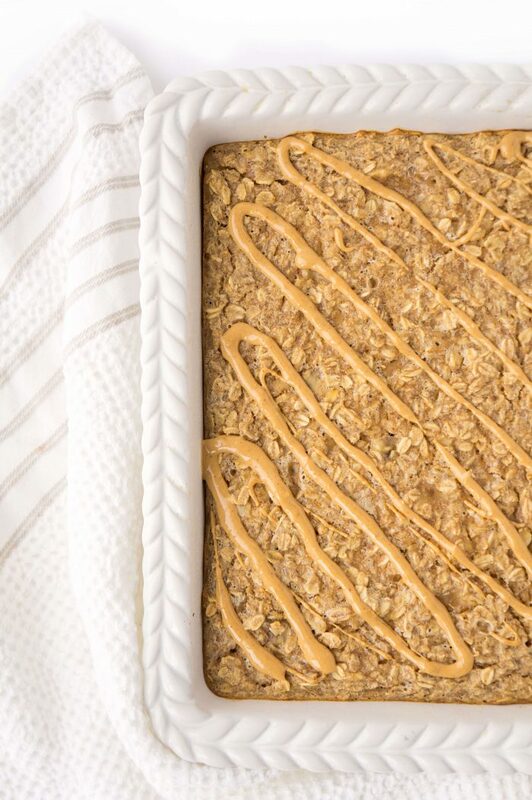 How Should You Serve Peanut Butter Baked Oatmeal? Now this is the fun part because you can jazz up that slice of baked oatmeal however you’d like. Personally, I like to serve it warm with a drizzle of natural peanut butter and additional freshly sliced banana. For easy drizzling, I recommend putting some peanut butter (preferably the natural drippy kind) into a medium ziploc bag. Cut the corner off with scissors and using your hand, ease the peanut butter out of the hole and drizzle over the baked oatmeal. Pretty fancy, right? Alternatively, you could serve it cold or at room temperature if that’s what floats your boat. It tastes good either way. You could also top it with another type of fruit such as fresh berries or even add a little drizzle of maple syrup. The options are really endless, so feel free to get creative! 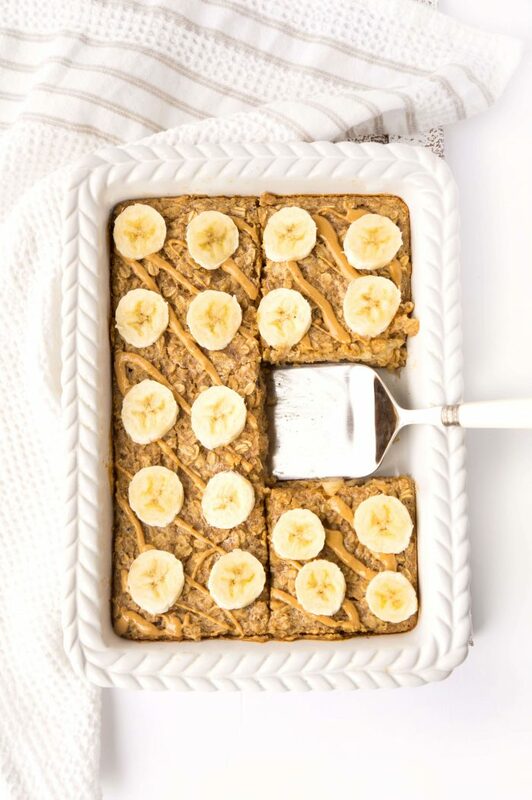 Can you freeze this Peanut Butter Banana Baked Oatmeal? Definitely! The baked oatmeal lasts for up to a week in the fridge, but beyond that, I would recommend freezing it. Sometimes I even freeze it as soon as it’s cooled if I don’t have the fridge space to store it. You can either cut it into pieces and freeze it in individual freezer bags if you’d like to take it for a quick pre-portioned breakfast or snack. 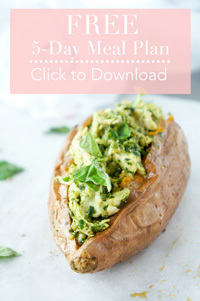 Alternatively, you can store it in a freezer-friendly container with each piece separated with parchment paper so that it doesn’t all stick together. Once again, totally flexible. I recommend freezing it for no longer than 3 months, but I seriously doubt it will last that long. It makes such a great breakfast for those busy mornings (which is basically every morning, amirite?!) So yeah. It’s basically good for every single morning for the rest of your life. What’s even better, is that the whole family can enjoy it from baby to grandma, so no need to go and make any special meals. That’s my kind of breakfast! Next, add milk, egg, vanilla, peanut butter, and maple syrup (if using). Stir to combine. Mash two of the bananas and fold them into the oatmeal mixture. Slice the remaining two bananas into quarter inch slices. Place half of the sliced bananas across the bottom of the prepared dish. Spread half of the oatmeal mixture over the banana slices. Evenly distribute the remaining slices over the oatmeal layer. To serve, top with a drizzle of peanut butter and additional banana slices, if desired. * I recommend using whole milk for babies and a lower fat milk option for adults. You can sub in a milk alternative such as unsweetened almond milk if dairy-free. Looking for some more easy oatmeal recipes? Check out these recipes! 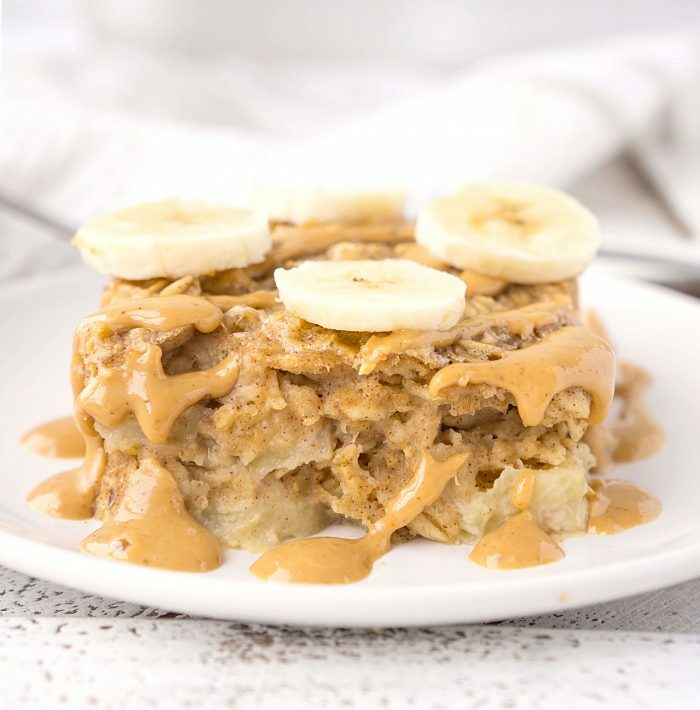 If you have a chance to try out this Peanut Butter Banana Baked Oatmeal, I’d love to see your pics! Tag me on instagram @hauteandhealthyliving and use the hashtag #hauteandhealthy! The recipe sounds great. I definitely would like to try it. Do the bananas get mushy and brown when you freeze the extras? Thanks Norma! Most of the bananas are incorporated into the oatmeal mixture, so I didn’t notice that they got brown or mushy when frozen. I would, however, hold off on adding any additional fresh banana slices to the top of the baked oatmeal until right before you’re ready to serve. Those would most likely go brown. Hope that helps!